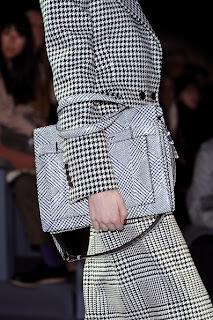 Salvatore Ferragamo FW2011 collection is aristocratic equestrian tradition revisited in a contemporary, urban key. Leather trimmings, laces and quilts and saddlery details purged of the more obvious rustic connotations create an allure definable as “modern urban Amazon”. The Collection is in two parts: the first is a continuation of summer weekends, featuring white, pink, natural pink and beige, enlivened with dashes of coral. Simple Capri trousers made of cotton gabardine combine with small cable-pattern cashmere tops and button-down shirts or white/beige 2-tone ponchos.The accessories are clean-lined: natural cowhide bags and moccasins with a “Gancino” ornament for relaxed elegance. The other part tends more towards the colours and weights of autumn: a new pearl pink contrasts with a very sophisticated burgundy, while the classic black and navy are ever present. The denim of the formal, high-waist trousers, with a rather male cut, is enhanced by a curly effect of the silk. The duffle coats have been restyled in a knitwear version with exquisite nappa detailing. 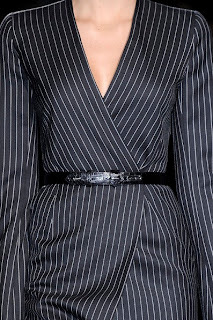 Little black dresses made of silk jersey become invaluable passe-partouts to wear with impeccable plateau pumps. Ponchos, jerseys and small double-sided trenches marry with riding boots and “cage” style shopping bags.